Registration opens on Tuesday, March 19 at 9:00 a.m. (PDT). Tours begin at 8:00 a.m. each day and last approximately 4 hours. Tour participants must be United States citizens and at least 18 years of age. All tour slots are filled on a first-come, first-served basis through an online registration system. There are also a limited number of "walk on" seats available. Please call 509.376.5840 for information. There is no cost to participate in the tours. All tours begin and end at the MSA Office Building located at 2490 Garlick Blvd., Richland, Washington . To request disability accommodation, please contact Jennifer Colborn, jennifer_m_colborn@rl.gov, 509-376-5840, in our external affairs office at least 10 working days prior to the tour. DOE makes every effort to honor disability accommodation requests. Registration Begins at 9:00 AM PDT on Tuesday, March 19, 2019. Visitors will be registered on a first-come, first-served basis only through the online web registration system. Age Must be at least 18 years of age. Citizenship Must be a United States citizen. Closed-toed shoes are MANDATORY. Sandals, flip-flops, open toe/open heel and high heel shoes are prohibited. Long pants and shirts with at least 4-inch sleeves required. Clothing must be appropriate for an industrial environment. Anyone not dressed appropriately will not be allowed on the tour. Prohibited Articles See Hanford Tours Prohibited Articles. Clearance/Badges Visitor badges are required and will be issued to all visitors the day of the tour. Government issued photo identification is required for each tour participant, and must be presented prior to visitors receiving their badges. See Required Forms of Identification for Hanford Site Access for important badging information. Please read information carefully. Name(s) provided on the online tour registration must match exactly the name(s) shown on photo ID. Members of the news media periodically cover Hanford's public tours. If a member of the news media is scheduled to be on your tour, you will receive advance notice, and you will be given an opportunity to "opt in" or "opt out" of appearing in any photographs or video footage on the day of your tour. 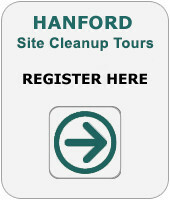 Note: Hanford Site Cleanup tours are subject to immediate cancellation any time due to unanticipated circumstances. In the unlikely event of an emergency the tour bus may be required to remain on the Hanford Site for longer than scheduled, or the tour may be immediately terminated. Tour participants should be prepared for delays or an earlier than normal return.